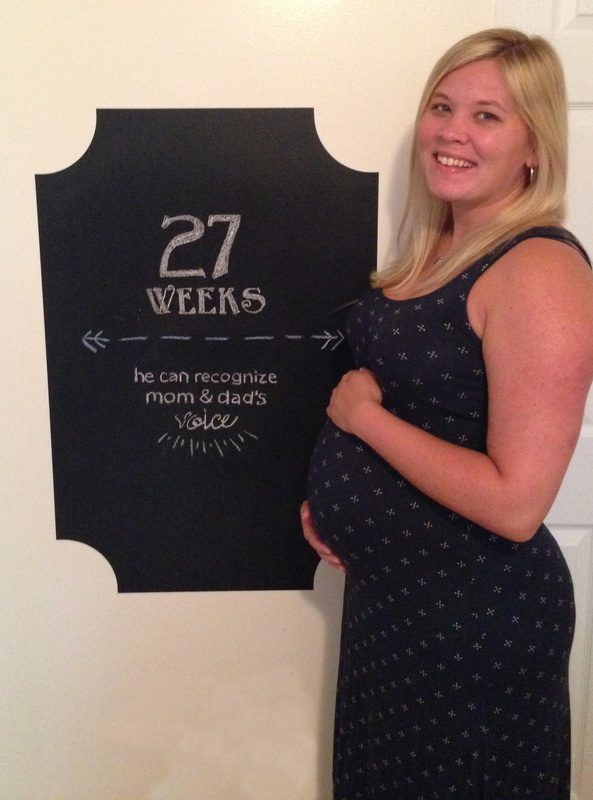 Week 27 – Our Happy Place & Co.
Maternity clothes: yes! I feel so much better when I dress the bump in clothes that are made for preggo women – and I have to say, maxi and sun dresses/skirts have become my new best friend and don’t make me feel so confined. I am on the hung for a perfect shower dress…Any of you ladies have a favorite online boutique? Stretch marks: Still no gain in this department (thank the Lord!) I have been using the mirror in the mornings after my shower to do a double check since its getting hard to see all the way around this belly. Sleep: this is deteriorating, sadly. The past week I’ve been exhausted around 8:30pm; in bed by 9:30, but up around 2:30am because I have to go to the bathroom and then am just wide awake for a least a few hours. Best moment of this week: Baby shower gifts are magically appearing! Every day this week we’ve had a box or package delivered to the door. It is making me feel so excited/impatient/scared. We really can’t wait to meet him and know that time is flying by so fast, but at the same time pray every day that he stays put in there where he can grow stronger and healthier at least for another 10 weeks. Miss Anything? I could really go for a mixed summer drink or a bottle of wine (yes, the bottle). I’m not a big drinker, but with summer being here and being outside with friends…I’m missing that little something extra. Food cravings: Fruit. I’ve literally gone through a bag of nectarines; a bag of cherries (over 2 days); and a bowl of strawberries (over a day and a half). Also, chocolate sf popsicles. yum! Anything that makes you queasy or sick: Nope. I haven’t been as hungry lately as in the past weeks. I’ll snack throughout the day (see above food cravings), but when it comes to sitting down to eat breakfast, lunch, and dinner, like we normally do, I’m not at all hungry nor do I want to think about food or cooking. Belly Button in or out? In, but ever so slightly. I’m waiting for it to pop. The scar that is right beside my belly button is stretched to the max and looks like I have a little jelly fish stuck to my stomach – yuk! Glad I can’t really see it. Wedding rings on or off? It’s a day by day decision. My wedding ring was still on for the longest time but was itching and hurting so bad, I just had to take it off. Now all the skin on the base of the finger is peeling off. Dan says I should just keep it off, but I honestly feel lost without it on. Pregnant girl problems. Happy or Moody most of the time: Happy – I keep thinking of what our days will be like in just a short period of time and how wonderful it will be to be a family of three (well, five with Murray and Theo) and how this tiny little person has been a missing link. We had to wait a very long time, and suffered some heartbreak along the way and now I just can’t wait to see what his life has in store and the happiness he’s going to bring for us and our extended family. Looking forward to: The Fourth of July Holiday and a 3 day weekend. There’s so much going on with work, on top of getting things in order to be out for maternity leave, that it’s driving me nuts. (I think that’s part of my ‘not being able to sleep’ problem) so I’m really looking forward to the upcoming holiday weekend that’s just around the corner.